Mycetoma is a serious inflammatory disease, which slowly and progressively destroys soft tissue. While most commonly seen on the feet, it can also occur on other parts of the body. It is caused by bacteria or fungus entering the body through a cut or wound and infecting the tissue beneath the skin. Although there are records of mycetoma dating back to ancient times, the first report in modern times came from the Indian town of Madura during the mid-19th century, so the disease was initially called “Madura Foot”. Most mycetoma patients are males between 20 and 40 years of age who are engaged in physically intensive labor, such as farming, in developing countries. Mycetoma was officially recognized as the 18th Neglected Tropical Disease at the World Health Assembly held in May 2016. Mycetoma is divided into two subtypes based on the cause of the infection. It is known as Actinomycetoma if caused by bacterial infection and Eumycetoma if caused by fungal infection. In either case, there are multiple pathogens. 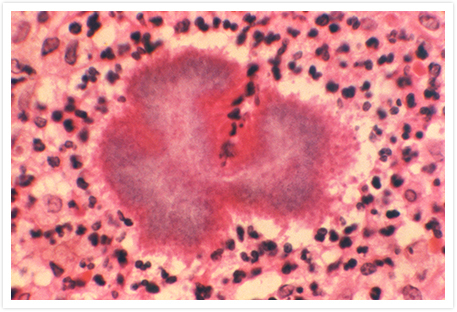 Known bacterial pathogens are Nocardia brasiliensis, Actinomadura madurae and Streptomyces somaliensis. For fungal infections, there are over 20 types, but the most commonly observed is Madurella mycetomatis. Infection is caused by pathogens entering the body through a small wound, such as a thorn prick, and this is why there is a strong correlation between mycetoma patients and bare-footed laborers. Mycetoma is not contagious and cannot be passed from person to person. 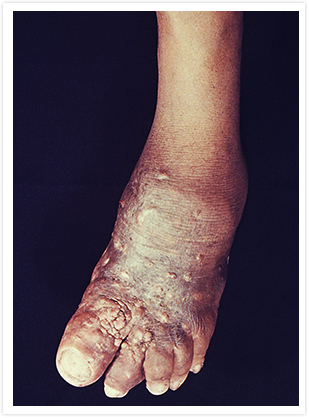 Mycetoma usually progresses slowly, and is characterized by painless lesions under the skin which multiply and excrete fluid containing bacterial or fungal grains. While the initial infection is typically in the foot, it has been known to spread to the rest of the limb. Left untreated, it can lead to physical disabilities and deformities (leading to social discrimination) and a second infection of the same wound can result in death by blood poisoning. Since most endemic regions have poor medical infrastructure and health education, and due to the slow, painless nature of the symptoms, most patients don’t seek help until the disease is already advanced. At this stage, surgery or amputation are the only viable treatments. Mycetoma can be diagnosed by microscopically examining surgical tissue biopsy or the fluid discharged by the lesions, however it is important to cultivate the organism to correctly identify the pathogen. DNA sequencing and various imaging technology are also options, but in most cases, endemic regions do not have access to these advanced tests. At present, there are no suitably simple diagnosis methods available. Besides removal of the infected area via surgery, there are medicinal treatments, but these differ depending on the pathogen. Actinomycetoma can be treated with antibiotics, and combination treatments of amikacin and co-trimoxazole have a >90% success rate. 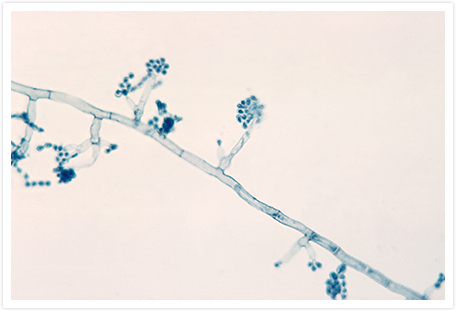 On the other hand, while azole anti-fungal drugs can be used to treat Eumycetoma, the success rate is only 25-35%, with a high likelihood of recurrence. As such, Eumycetoma is treated with both a lengthy course of anti-fungal drugs (over 12 months) and surgery. Ketoconazole (an oral agent) was originally an option, but this drug is now banned by the regulatory authorities in Europe and America (EMA, FDA) due to risk of liver toxicity. This leaves itraconazole as the only effective anti-fungal agent. This drug requires long-term adherence, side-effects may be a problem, and benefits are limited. Cost burdens are also an issue, with over 50% of patients stopping treatment midway. This often results in recurrence, with the patients ultimately needing surgery or amputation. There is still no viable method to control or prevent mycetoma. While complete suppression is difficult, it is possible to visit endemic regions and warn the inhabitants not to walk barefoot. While the organisms that cause mycetoma are found worldwide, tropical and subtropical zones in the “Mycetoma belt” (including the Bolivarian Republic of Venezuela, Chad, Ethiopia, India, Mauritania, Mexico, Senegal, Somalia, Sudan and Yemen) are most at risk. Mycetoma is not reportable by law, and since there is no surveillance system in place to gather information, the number of patients and outbreaks are unclear. According to a study published in 2013, which was based on 50 scientific reports from 1956 onwards, 8,763 cases were reported, of which 75% were from Mexico, Sudan and India. But since these reports only represent a single hospital per country, the actual figure is thought to be far higher. There are no current estimates for the number of deaths due to mycetoma. A research and development project relating to new treatments for eumycetoma was launched in collaboration with the international NPO, Drugs for Neglected Diseases initiative (DNDi), in September 2015. DNDi is conducting clinical trials in Sudan using Eisai’s anti-fungal agent E1224 (fosravuconazole).